Editor's Notes: You may have noticed that there are multiple columns up on the website about the rumored return of Degeration-X. If you read a column (ANY column) and decide to send in feedback, PLEASE be sure to indicate which column you are responding to by typing the TITLE of the column in the subject line. Also, DO NOT FORGET to sign your name. Thanks! Ten years ago, when World Wrestling Entertainment was known as the World Wrestling Federation, we were introduced to a very soft-spoken southern individual looking out on the beach. He introduced himself as Waylon Mercy-portrayed by former Skyscraper and wrestling veteran Dan Spivey, and informed us that he was a "peaceful man who liked his peaceful surroundings." He stated that he was a peaceful individual who likes no problems, and once he made his debut, he would make sure that the WWF was "gonna be peaceful... you know what I mean"!" Now, while this man seemed like a very optimistic individual who had a love for white pants and Hawaiian shirts, one could tell that Waylon was a troubled soul; he had a tattoo of a dagger right in the middle of his forehead, and he had tattoos of various sayings, such as "redemption," "torment," "restitution," and of course-"mercy." Now, in all of his vignettes, you could automatically make the notion that this man was a heel. Allow me to take you back to Saturday, July 1, 1995-the WWF SuperStars debut of Waylon Mercy. As the fans awaited the appearance of this "peaceful individual," a piano chord struck, and a strong southern accent made the announcement that: "Lives are gonna be in Waylon Mercy's hands... you know what I mean"! HA-HA-HA-HA-HA!!!" Right away, we knew that we were in for something special. Waylon stood about 6'7" and hailed from Griffin, Georgia. Well, Waylon started off alright; he shook some of the fans' hands and gave them high fives, and he smiled and grinned. Now, here's the kicker: this man shook the referee's hand, and then he shook his opponent's hand. Oh, sure-nothing wrong with good sportsmanship... that is, until the bell rings! Once the bell sounded, Waylon turned from a calm Southern gentleman into a psychopathic lunatic! He viciously assaulted his opponent with reckless abandon-at one point, he even offered to "help his opponent up the steel ring steps," and when the referee admonished him, Waylon would say, "I'm sorry, Ref-HE SLIPPED!!!" How does someone slip off the steps, especially after Waylon has just rammed one's head into the steps several times"
After inflicting enough pain and suffering on his opponent, Waylon would straitjacket his opponents Hannibal Lector-style with the dreaded and legendary Sleeperhold. As he would apply the Sleeperhold, Waylon would have this crazed look in his eyes as if he were enjoying squeezing the life out of his opponent. Thankfully, the referee would stop the match and declare Waylon Mercy as the victor. After which, Waylon would go back to his calm, peaceful self, but you just knew that this man was a troubled soul; something was VERY, VERY WRONG with him... and that is what made the Waylon Mercy character so great! Waylon Mercy was in the WWF(E) for only three months, and in those three months, he only had two losses to his credit. The first loss was via disqualification against Bret "Hitman" Hart, and the second lost was via pinfall to Savio Vega. The last time we saw Waylon Mercy, he had just defeated Diesel via count-out, only to suffer a Jackknife Powerbomb for his troubles. Unfortunately for us, Dan Spivey retired from the wrestling business due to several nagging injuries, leaving us wrestling fans to ask the question of "What if"" Would we have ever seen Waylon Mercy square off against the likes of Shawn Michaels, Stone Cold Steve Austin, Triple H, The Rock, and perhaps even Undertaker" Hey, how about Waylon Mercy vs. Kane" Would Waylon have won the WWE Intercontinental Title"
We may never know exactly what it was that Waylon meant, but we can always dream... YA KNOW WHAT I MEAN"! by Nicholas S. Johnson .. I wanted to first thank you for writing this article. 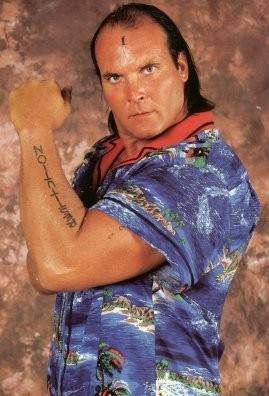 Waylon Mercy was a character that I was getting behind solidly before his sudden disappearance from the WWF. At the time, I hung out with some other die hard wrestling fans (we'd talk wrestling for 12 hours straight sometimes) and we all saw the appeal of this character. Many times I have wondered what would have happened if Spivey hadn't retired. While Mercy never would have made World Title status, he may have eventually won the IC Belt. I honestly think it was one of the better gimmicks that WWF had come up with. Too bad we'll never know. I remember Waylon Mercy well, Nicholas. Never cared much for him as a wrestler, but I liked the character. Far above the plain Jane psycho that Dan Spivey was, at least in WCW. That character, however, really wasn't his own, or the product of the great WWF gimmick machine. Everything I can remember about him parallels to a tee everything I remember about Max Cady (Robert DeNiro) from Cape Fear. I think this was meant to be a given, though, of course, nobody what mention it on TV. So if you want to "know what he means", get to your local video store and pick up a copy of Cape Fear. On top of being a great film, you'll get to see Waylon in a decent storyline for once. You're absolutely right! I can't remember an impact as big as Waylon Mercy in his short run with WWF(E). Dan Spivey did a really great job on the Waylon Mercy gimmick, he simply was electrifying. I know many people who still ask themselves where Mercy's way would have gone if it lasted longer. Up to the top I think and so do they! Hey guys this is Bull Buchanan and I stumbled up on this article and I just had to respond. Waylon Mercy was one of my favorite characters at that time in the WWF. It was unfortunate that his run came to an end so early as I think it could have went far. The author posed the question" what about Waylon vs. Kane or Waylon vs. Brett well, the answer to those questions was closer than anyone knew. After my run in the RTC we knew they were going to dismantle the group and everyone would go back to being who they were before. I went to a few of my friends(Michael Hayes, Jack Lanza) and after getting positive reviews from them I hit Vince with an idea. Let me bring back the Waylon Mercy gimmick. Vince loved it, everyone loved it, it made perfect sense. My southern gospel approach to the RTC would fit perfectly with what Waylon was supposed to have been. Waylon was Vince's take on the character from Cape Fear played by Robert Deniro. I was told to make it a 2000 version of the original. I was sent all of Waylon's promos and matches and when we went off the road I went to Cornette with the idea and he was also a fan of it. The next 6 months were spent in OVW creating the new Waylon and with Cornette's help things were really comming together. What happened" Who knows. I wound up being a rapper, which was a ton of fun but I often wonder what would Bull's version of Waylon would have meant when he said " know what I mean""
Cool article. Waylon Mercy was one of the first gimmicks that attempted to break the mold of a cartoon-ish WWF character to something deeper and more sinister. Sadly, Dan Spivey was just too beat up with ring injuries to carry it out to it's full extent, because he certainly had the role down pat. Well, a year later, they hit gold with Mankind, so at least they kept trying at the "tortured soul" character and got it to work. But there's no doubt, Waylon Mercy goes down alongside Goldust as one of the most unique gimmicks they ever came up with. I would have loved to have seen what Bull would have done with the character, but instead we got warmed over attempts at it like Nathan Jones and Deacon Batista. Waylon Mercy was definitely headed for big time things in the WWF/WWE. His character was brilliant and would have lasted to this day. This would of drastically altered the course of history in the WWE as we know it today. Would there have been a Stone Cold Steve Austin or would the "Ringmaster" been a JTTS for a few years and faded away? Would Mick Foley have entered the WWF as Mankind or would he have come in as Cactus Jack right off the bat? Would he have come in at all? If Spivey remained healthy, he was on a certain path to stardom. Know what I mean? If your email is intelligently written, they will be posted underneath this messege..
We at OnlineWorldofWrestling want to promote all points of view, and that includes YOURS. © 2015, Black Pants, Inc. All other trademarks are property of their respective holders.